The regulation of glucagon secretion from alpha cells is poorly understood. Since action potential firing at low glucose is required for glucagon secretion, we hypothesised that voltage-dependent K+ (Kv) currents limit glucagon secretion under these conditions, similarly to their role in insulin secretion. Kv currents and action potential firing of mouse and human alpha cells, identified by immunostaining, were examined by whole-cell patch-clamp. Glucagon secretion from mouse and human islets was measured by ELISA. Kv current density was 35% larger in alpha than in beta cells. Alpha cell Kv channels were sensitive to block by tetraethylammonium (TEA) and 4-aminopyridine. Surprisingly, Kv channel inhibition reduced glucagon release to the same extent as glucose. Robust action potential firing was observed in beta cells when ATP-sensitive K+ channels were closed, but in alpha cells a negative current (−8 pA) injection was required for action potential firing. TEA (0.5 mmol/l) impaired alpha cell action potential firing, which could be restored by further hyperpolarising current injection (−16 pA). Kv currents were more sensitive to the Kv2 inhibitor stromatoxin (100 nmol/l) in mouse (80%) than in human (45%) alpha cells. Finally, the maxi-K (BK) channel inhibitor iberiotoxin (100 nmol/l) blocked 55% of the current in human alpha cells and inhibited glucagon release from human islets. Kv currents in alpha cells are positive regulators of glucagon secretion. These currents, mediated by Kv2 and BK channels, limit membrane depolarisation, and prevent inactivation of alpha cell action potentials and suppression of glucagon release. 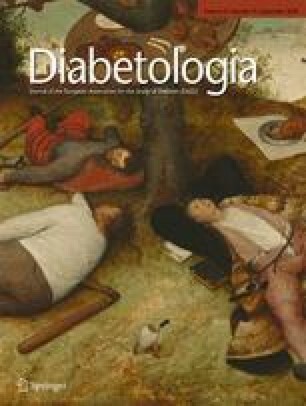 Glucagon increases blood glucose by stimulating gluconeogenesis and glycogenolysis and is inappropriately elevated in diabetic patients . The regulation of glucagon secretion from pancreatic alpha cells is complex and may be affected by paracrine signals including insulin, Zn2+, gamma amino butyric acid and somatostatin, by endocrine signals including glucagon-like peptide-1 and by autonomic input . While action potential firing at low glucose is required for glucagon secretion [3, 4], the downstream control of action potential generation in alpha cells is not well understood. Like insulin-secreting beta cells, alpha cells possess robust voltage-dependent K+ (Kv) currents, which are believed to participate in action potential repolarisation [3, 4, 5, 6, 7]. Levels of several Kv channel isoforms, including mRNA transcript or protein levels of Kv2.1, Kv3.1, Kv3.2, Kv3.3, Kv4.3, Kv6.1 and Kv6.3, have been reported in alpha cell lines [6, 8] and primary human  and mouse  alpha cells, although the functional contribution of these to alpha cell Kv currents is not well established. Pancreatic beta cells produce the Kv channel isoforms Kv2.1 and Kv1.4, as well as the Ca2+-dependent maxi-K (BK) channel, which play important roles in the repolarisation of rodent and human beta cell action potentials [11, 12, 13, 14]. Inhibition of these has the generally straightforward effect of increasing action potential duration, intracellular Ca2+ responses to glucose and glucose-dependent insulin secretion [11, 12, 13, 15, 16]. Inhibition of alpha cell Kv currents may then be expected to prolong or enhance action potential firing and glucagon secretion at low glucose concentrations. However, one study reports that the general Kv channel inhibitor 4-aminopyridine inhibited glucagon secretion . Given the complex regulation of alpha cell function and previous observations that depolarisation of alpha cells may inhibit rather than stimulate alpha cell action potential firing and glucagon release [3, 18], the role of the hyperpolarising Kv current in alpha cell function is far from clear. In the present work we show that, similarly to the beta cell, Kv2 family channels contribute a significant proportion of the Kv current in mouse and human alpha cells. Additionally, large-conductance Ca2+-sensitive BK channels contribute a majority of Kv current in human, but not mouse alpha cells. We also show that these hyperpolarising currents play an important positive role in glucagon secretion, since inhibition of them impairs glucagon release at low glucose. We found that this is due to the depolarisation-dependent inhibition of action potential firing, which can be ‘re-initiated’ by injection of a hyperpolarising current. Thus, alpha cell Kv currents, mediated by Kv2 and BK channels, act to limit membrane depolarisation and to prevent inactivation of alpha cell action potentials and suppression of glucagon release. Mouse islets from male C57BL6 mice (Charles River, Montreal, QC, Canada) were isolated by standard collagenase digestion followed by hand-picking and then cultured in RPMI (Gibco 11875; Life Technologies, Carlsbad, CA, USA) with 10% FBS (vol./vol.) and 100 U/ml penicillin/streptomycin at 37°C and 5% CO2. Human islets from 11 healthy donors from the Clinical Islet Laboratory at the University of Alberta were cultured in DMEM (Gibco 11885) with 10% FBS and 100 U/ml penicillin/streptomycin at 37°C and 5% CO2. Islets were dispersed into single cells by incubation for 11 (mouse) or ∼20 (human) min at 37°C in a Ca2+-free solution (in mmol/l: 138 NaCl, 5.6 KCl, 1.2 MgCl2, 5 HEPES, 3 glucose, 1 EGTA, with 1 mg/ml albumin at pH 7.3 with NaOH), followed by mechanical dispersion with flame-polished glass pipette. All studies were approved by the Animal Care and Use Committee and the Human Research Ethics Board at the University of Alberta. Whole-cell patch-clamp was performed with an EPC10 amplifier controlled by PatchMaster software (HEKA Electronik, Lambrecht, Germany). Patch pipettes pulled from thin-walled borosilicate glass tubes were fire-polished, coated with Sylgard and had resistances between 3 and 7 MΩ when filled, for whole-cell experiments, with intracellular solution (in mmol/l: 140 KCl, 1 CaCl2, 1 MgCl2, 10 HEPES, 10 EGTA and 3 ATP-Mg [pH 7.3 with KOH]). Some experiments were performed with perforated patch pipettes pulled from thick walled borosilicate glass tubes, with resistances between 5 and 9 MΩ when filled with (in mmol/l) 76 K2SO4, 10 KCl, 10 NaCl, 1 MgCl2 and 5 HEPES (pH 7.25 with KOH), and back-filled with 300 nmol/l amphotericin B. Extracellular solution was (in mmol/l): 135 NaCl, 5.4 KCl, 1 CaCl2, 1.2 MgCl2, 10 HEPES, 5 glucose (pH 7.3 with NaOH). When tetraethylammonium (TEA)-Cl was present, NaCl concentrations were reduced accordingly. Other channel blockers were added individually as indicated to the extracellular solution. Experiments were performed at room temperature, except where noted otherwise. Analysis was performed using a software package (FitMaster; HEKA Electronik). Relative Kv channel conductance is derived from tail currents at −30 mV following depolarisation. In all experiments, cells were positively identified as alpha or beta cells by immunostaining for glucagon (guinea pig anti-glucagon, 1:5,000; Linco, St Charles, MO, USA) and insulin (rabbit polyclonal IgG, 1:300; Santa Cruz Biotechnology, Santa Cruz, CA, USA), and appropriate secondary antibodies (Alexa Fluor 594 goat anti-guinea pig and Alexa Flour 488 goat anti-rabbit IgG, 1:200; Invitrogen, Eugene, OR, USA). Islets were pre-incubated for 2 h at 37°C and 5% CO2 in 0.5 mmol/l glucose KRBH (in mmol/l: 115 NaCl, 5 KCl, 24 NaHCO3, 2.5 CaCl2, 1 MgCl2, 10 HEPES, with 2% wt/vol. BSA, pH7.4). Test incubations (of 1 h) were in KRBH with 0.5 or 15 mmol/l glucose, and Kv channel inhibitors as indicated, after which an inhibitor cocktail (Protease Inhibitor Cocktail for Mammalian Cells; Biobasics, Markham, ON, Canada) was added to the samples for analysis within 3 days by glucagon ELISA (Alpco, Salem, NH, USA). Data are presented as means ± standard errors. Groups are compared by multiple comparison ANOVA and the unpaired Student’s t test. The alpha cells of mice are reported to possess TEA-sensitive delayed outward Kv current and a TEA-resistant Kv current showing rapid A-type inactivation [4, 10]. We characterised Kv currents by whole-cell patch clamp electrophysiology in mouse and human alpha cells and compared these with currents recorded from beta cells, in each case identified by glucagon and insulin immunostaining (Fig. 1). Kv currents from mouse alpha cells activate at voltages greater than −30 mV, and show a half-maximal activation at −6.8 ± 0.7 mV (n = 34) and a maximum current density at 70 mV of 341 ± 15 pA/pF (n = 34). Results were similar in human alpha cells, where half-activation was observed at −6.8 ± 1.0 mV (n = 12) and peak current at 70 mV was 312 ± 21 pA/pF (n = 12). Beta cell Kv current activated at more negative potentials with half-activation values of −15.0 ± 0.7 and −11 ± 6.8 mV in mouse (n = 10, p < 0.001) and human (n = 3) beta cells, respectively (Fig. 1). Thus, in comparison to beta cells, Kv currents in alpha cells are relatively larger, but require a stronger depolarisation for activation. At room temperature, mouse and human alpha cell Kv currents inactivated with two time constants. A rapid component inactivated with a time constant (τ 1) of 479 ± 78 and 254 ± 70 ms in mouse (n = 26) and human (n = 10) alpha cells, respectively, but this accounted for only a minor component (16 ± 2%) of current inactivation (Fig. 2). Most Kv inactivation in these cells occurred with a slower time constant (τ 2) of 4.8 ± 0.9 and 4.1 ± 0.3 s in mouse (n = 31) and human (n = 12) alpha cells. At near physiological temperature (32°C) the rate of alpha cell Kv channel inactivation was increased (τ 1 = 200 ± 45 ms, τ 2 = 1.2 ± 0.1 s in mouse; τ 1 = 173 ± 63 ms, τ 2 = 1.5 ± 0.2 s in human) and τ 1 accounted for 34 ± 6% and 38 ± 12% of current inactivation, respectively. Thus, as the ‘fast’ inactivation component (τ 1) was somewhat more rapid at 32°C, the so-called ‘slow’ (τ 2) component was increased by nearly threefold. Together this resulted in a more rapid inactivation of these currents at near-physiological temperature. In mouse beta cells, similarly to previous results in rat , Kv currents inactivated with a single, slow time constant at room temperature (τ = 4.7 ± 0.4). However, at 32°C two time constants were detectable (τ 1 = 338 ± 95 ms; τ 2 = 1.9 ± 0.2 s, n = 12). Finally, in mouse and human alpha cells, the voltage-dependence of steady-state current inactivation was half-maximal at −34.1 ± 0.9 (n = 31) and −31.4 ± 1.9 mV (n = 8) respectively. In mouse, this was significantly right-shifted compared with values observed in beta cells (−41 ± 1.2 mV, n = 9, p < 0.001), meaning alpha cell Kv currents are less sensitive to depolarisation-induced inactivation. TEA (n = 41) and 4-aminopyridine (n = 39) inhibited mouse alpha cell Kv current in a dose-dependent manner, with IC50 of 0.3 and 1.4 mmol/l respectively, although a small highly TEA-sensitive component (IC50 <10 μmol/l) was also observed (Fig. 3c, d). Notably, we did not observe the TEA-resistant rapidly inactivating current component reported previously in isolated alpha cells  and alpha cells from intact islets . In beta cells, inhibition of Kv currents with TEA augments insulin secretion in a glucose-dependent manner, since Kv channels contribute to action potential repolarisation [11, 16, 20]. Since alpha cells are electrically active at low glucose [3, 4, 21], we hypothesised that inhibition of Kv currents at low glucose concentrations should enhance glucagon secretion under this condition, due to action potential prolongation as is the case for beta cell insulin secretion. Surprisingly, however, we found that Kv channel inhibition, with TEA concentrations near the IC50 for alpha cell Kv currents (0.5 and 2 mmol/l), inhibited glucagon secretion from mouse (n = 3 mice, three replications each, p < 0.01) and human (n = 2 donors, three replications each, p < 0.05) islets at low glucose (0.5 mmol/l) to the same extent as was seen with glucose stimulation (15 mmol/l) alone (Fig. 3e, f). Thus, alpha cell Kv currents play a positive role in glucagon secretion at low glucose concentrations, since inhibition of alpha cell Kv currents impairs glucagon secretion. While beta cells fire action potentials in response to glucose stimulation , action potential firing in alpha cells occurs at low glucose and is responsible for the Ca2+-entry required for glucagon secretion [3, 4, 21]. We examined action potential generation in mouse alpha and beta cells at 32°C under whole-cell current clamp where ATP-sensitive K+ (KATP) channels were held closed by intracellular dialysis of 3 mmol/l ATP. Action potential firing was initially examined during a series of current injections ranging from −40 to 18 pA. Robust action potential firing could be elicited in alpha and beta cells; action potentials were similar in amplitude and duration to those we observed from alpha cells by perforated patch-clamp (Fig. 4). Maximum action potential firing frequency was somewhat higher in alpha cells than in beta cells (17.8 ± 1.5 Hz, n = 16 and 13.8 ± 1.2 Hz, n = 27; p < 0.05). This is consistent with a larger alpha cell Kv current density, which would contribute to more rapid repolarisation, thus allowing the next action potential to fire sooner. There was no difference in action potential peak voltages (−8.7 ± 1.4 and −11.4 ± 1.5 mV) and amplitudes (39.0 ± 2.5 and 34.9 ± 2.4 mV), and although action potential duration was somewhat lower in alpha cells (33.6 ± 5.9 vs 42.8 ± 4.9 ms), this did not reach statistical significance. Consistent with a role for alpha cell Kv currents in action potential repolarisation, the general Kv channel blocker TEA (10 mmol/l) increased peak voltage (5.8 ± 4.8 mV, n = 8, p < 0.01) and action potential duration (103.4 ± 40.2 ms, n = 8, p < 0.05). Interestingly, action potential firing was not observed in alpha cells in the absence of current injection, but was observable in beta cells under this condition (Fig. 4e–g). For action potential firing to be observed in alpha cells, injection of a negative, hyperpolarising current of approximately −8 pA was required. Further hyperpolarising current (−16 pA) was sufficient to prevent action potential activation in both cell types. This means that under the present condition of elevated intracellular ATP, alpha cell action potentials are elicited by a hyperpolarising rather than by a depolarising current, suggesting that depolarisation impairs alpha cell action potential firing, which can be restored by lowering the membrane potential. Overall, alpha cells fired action potentials over a narrower range of current injections than beta cells (Fig. 4f, g). We then examined the effect of 0.5 mmol/l TEA, which we had observed to inhibit glucagon secretion, on action potential generation in alpha and beta cells. The addition of 0.5 mmol/l TEA promoted action potential firing in beta cells, but surprisingly inhibited action potential firing in alpha cells (Fig. 4f, g). In alpha cells, TEA caused a left-shift in the requirement for negative current injection. That is, a greater amount of hyperpolarising current injection (−16 pA) was required to ‘re-activate’ action potential firing in the presence of TEA (Fig. 4f, g). Therefore, a TEA-sensitive K+ current promotes alpha cell hyperpolarisation to allow regenerative electrical activity. When this current is inhibited, action potential firing can be re-activated by introduction of an exogenous hyperpolarising current. The ‘re-activation’ of action potential firing in alpha cells by introduction of hyperpolarising current suggests that alpha cell action potential firing is inactivated by depolarisation, probably due to inactivation of Na+ and Ca2+ channels [3, 18]. To examine the depolarisation-dependence of alpha cell action potentials directly, we subjected alpha cells to 5 s conditioning current injections (ranging from −40 to 0 pA), which effectively set the resting membrane potential at a series of increasing values (between −120 and −10 mV). The membrane potential was then brought to a negative potential and depolarised with a ramp-injection to 0 pA, to elicit one or more action potentials (Fig. 4h, i). Action potentials could be elicited from beta cells, even following pre-conditioning at relatively depolarised membrane potentials (i.e. >−50 mV) (Fig. 4h). However, action potentials elicited from alpha cells were severely impaired by pre-conditioning at these depolarised potentials. This voltage-dependent inactivation of action potential firing occurred with a mid-point of −40.9 ± 2.6 mV (n = 14), was similarly observed in perforated-patch experiments with a mid-point of −37.1 ± 4.8 mV (n = 8) and paralleled the membrane potentials at which action potential firing declined during the 1 s current injections (Fig. 4i). Therefore, alpha cell action potentials are inhibited by membrane depolarisation. We examined the effect of isoform-specific inhibitors on Kv currents in mouse and human alpha cells (Fig. 5). The Kv4.2/Kv4.3 inhibitor phrixotoxin (100 nmol/l) failed to inhibit Kv current in mouse alpha cells (Fig. 5a–c). Iberiotoxin (100 nmol/l), an inhibitor of the large-conductance Ca2+- and voltage-sensitive K+ channel BK, had a small but insignificant effect on mouse alpha cell Kv currents (Fig. 5a–c). However, stromatoxin (100 nmol/l) produced a 51% inhibition of mouse alpha cell Kv current at 70 mV (p < 0.001, n = 10). Stromatoxin inhibits Kv2.1 and Kv2.2 by causing a right-shift in the voltage-dependence of channel activation. Indeed, the majority of alpha cell Kv current activation was right-shifted to potentials greater than 40 mV (Fig. 5c), and we estimate that the stromatoxin-sensitive current accounts for 80% of mouse alpha cell Kv current. In human alpha cells the Kv2.1/Kv2.2 channels appear to contribute somewhat less current than in mice, although stromatoxin (100 nmol/l) was still seen to cause a right-shift in activation of ∼45% of the Kv current in these cells (p < 0.001, n = 6) (Fig. 6a–c). A greater proportion (55%) of human alpha cell Kv current was sensitive to iberiotoxin (100 nmol/l; p < 0.001, n = 4), demonstrating a significant contribution of BK channels to human alpha cell Kv currents. A role for BK channels in glucagon secretion from human islets is demonstrated by the ability of iberiotoxin (100 nmol/l) to inhibit glucagon secretion at 1 mmol/l glucose, an effect similar to that seen with the general antagonist TEA (six replicates from two donors, p < 0.05) (Fig. 6d). Previous reports have shown the importance of Kv2.1 channels in rodent beta cells [11, 12, 13, 14] and BK channels in human beta cells . However, the identity and role of Kv channels in glucagon-secreting alpha cells remains unclear. We have now demonstrated that human and mouse alpha cells possess Kv currents that are sensitive to the Kv2.1 and Kv2.2 inhibitor stromatoxin. While this accounts for the majority of current in mouse alpha cells, a large portion of human alpha cell Kv current is sensitive to the BK inhibitor iberiotoxin, mirroring the differential functional contribution of Kv2.1 and BK in mouse and human beta cells [13, 15]. Inhibition of alpha cell Kv currents by TEA or selectively by the BK inhibitor iberiotoxin in human islets inhibited glucagon secretion under low-glucose conditions to a degree similar to that seen with high glucose. This was due to the ability of Kv channel block to inhibit alpha cell action potential firing, suggesting that alpha cell Kv channels contribute an important hyperpolarising current that prevents depolarisation-induced inhibition of alpha cell action potential firing. If we assume that membrane depolarisation at low glucose stimulates alpha cell action potential firing and glucagon secretion, then inhibition of alpha cell Kv currents should augment glucagon secretion under this condition. This would be similar to the well-known effect of inhibiting beta cell Kv currents on insulin secretion, even with very high concentrations (20 mmol/l) of TEA [11, 16, 20]. We found that alpha cell Kv currents are inhibited by low millimolar levels of TEA and 4-aminopyridine. Surprisingly, inhibition of alpha cell Kv currents with 0.5 to 2 mmol/l TEA did not augment, but rather inhibited glucagon secretion induced by low glucose. This is consistent with the ability of ERG channel inhibition with rBeKm-1 to inhibit glucagon secretion . It is unlikely that suppression of glucagon secretion under these conditions is mediated by paracrine inhibition via beta cell secretory products. While TEA enhances glucose-dependent insulin secretion, the concentrations used here are well below the EC50 for stimulation of insulin secretion from rodent islets (8.24 mmol/l)  and TEA is well known to have no beta cell stimulatory effect at low glucose [11, 20]. Therefore, it is likely that TEA acts directly on alpha cells to suppress glucagon secretion. Glucagon secretion at low glucose is dependent upon action potential firing [4, 21]. The mechanisms controlling action potential generation in alpha cells are not well understood. Various reports have suggested that stimulation of alpha cells with glucose causes either membrane hyperpolarisation  or depolarisation [3, 18]. Our recent work demonstrates that, although glucose-dependent inhibition of KATP channels may not represent a major or sole mechanism contributing to the suppression of glucagon secretion , titrating KATP activity with diazoxide can re-activate alpha cell Ca2+ signalling and glucagon secretion in the presence of high glucose. While this provides indirect evidence of the involvement of membrane depolarisation in suppression of glucagon secretion  and the Ca2+ and Na+ channels involved in action potential depolarisation are clearly subject to voltage-dependent inactivation [3, 18], the relationship between membrane depolarisation and termination of alpha cell action potential firing is unclear. The present results demonstrate that alpha cell action potentials are indeed terminated at depolarised membrane potentials, such as in the whole-cell and perforated patch-clamp experiments shown in Fig. 4, an effect due to the voltage-dependent inhibition of alpha cell action potential generation that closely followed the steady-state inactivation properties of Ca2+ and Na+ currents reported in alpha cells from intact mouse islets . Thus depolarisation can indeed shut off alpha cell action potentials. Moreover, treatment with 0.5 mmol/l TEA exacerbated this effect (Fig. 4g), causing a left-shift in the hyperpolarising current injection required to activate action potential firing. Thus, the TEA-sensitive Kv current in alpha cells provides crucial hyperpolarisation, which prevents inactivation of action potentials, allowing regenerative action potential firing and glucagon secretion at low glucose. The presence of several Kv channel isoforms has been reported in an alpha cell line [6, 8], and in human  and mouse  alpha cells, including mRNA transcript or protein production of Kv2.1, Kv3.1, Kv3.2, Kv3.3, Kv4.3, Kv6.1 and Kv6.3. In human islets, Braun et al. reported the presence of mRNA transcript for Kv2.1 and Kv2.2, and although this data is not specific to alpha cells, they also reported high expression of BK channels. Based on the sensitivity of alpha cell Kv currents to stromatoxin and iberiotoxin, we propose that Kv2 channels are functional in mouse alpha cells, while Kv2 and BK are functionally present in human alpha cells. This latter observation is supported by the ability of iberiotoxin to inhibit glucagon secretion from human islets. It is not entirely clear that the Kv2 channels observed are represented solely by Kv2.1. However, Kv2.2 is also sensitive to stromatoxin and displays IC50 values for inhibition by TEA and 4-aminopyridine that are closer (∼1 mmol/l) to the values reported here . Functional Kv channels are often heterotetramers, and the native alpha cell Kv2 channel may include Kv2.1 and Kv2.2 subunits, and possibly the Kv6.1 reported previously , as this subunit may also combine with Kv2 channels. Due to a lack of suitable pharmacological inhibitor, we did not investigate Kv3 channels in detail here. However, our observation that Kv2.1/Kv2.2 and BK account for the majority of Kv current in alpha cells suggests that Kv3 channels play only a minor role. Finally, Kv4.3 has been suggested to contribute a rapidly inactivating TEA-insensitive Kv current in mouse alpha cells [3, 6, 19]. We did not detect such a current in our preparation, and the Kv4.3 inhibitor phrixotoxin had no effect on alpha cell Kv currents in our hands. This discrepancy may relate to differences in cell preparation, cell identification or recording conditions. Previous studies examined alpha cells identified electrophysiologically in intact islets  or green fluorescent protein (GFP)-negative single cells from mouse insulin promoter-GFP islets [6, 19]. The present study examined isolated cells, which were identified post-experimentation by glucagon immunostaining. We also note that we did indeed detect a stromatoxin-insensitive inactivating current component in some human alpha cells (not shown), but this was observed in only one donor. Thus, we now demonstrate that mouse alpha cell Kv currents are mediated principally by Kv2.1 and/or Kv2.2, while these channels together with the Ca2+-sensitive BK channels mediate the majority of human alpha cell Kv current. These channels act as positive regulators of glucagon secretion induced by low glucose in mouse and human islets, by providing a hyperpolarising current that prevents the depolarisation-dependent inactivation of alpha cell action potential firing. Therefore, inhibition of alpha cell Kv currents, particularly those mediated by BK channels, may provide a novel therapeutic approach to the treatment of hyperglucagonaemia in patients with diabetes. The authors are grateful to N. Smith for excellent technical support, and to J. Shapiro and the Clinical Islet Program at the University of Alberta for provision of human donor islets. Research funding was provided by an Investigator Initiated Study Protocol (Merck), with additional support from a National Sciences and Engineering Research Council of Canada Discovery Grant. A. F. Spigelman is supported by Studentships from the Alberta Diabetes Foundation and the Newman’s Own Foundation. P. E. Macdonald holds scholarships from the Canadian Diabetes Association and the Alberta Heritage Foundation for Medical Research, and also the Canada Research Chair in Islet Biology.